The Rio Grande Cutthroat Trout, (Oncorhynchus clarki virginalis,) is officially the New Mexico State Fish. It is native to the cold mountain streams and lakes of northern New Mexico. It was adopted as the state fish in 1955. Though not indicated specifically, it's generally accepted that the intention of the legislation was to name the Rio Grande cutthroat trout (Oncorhynchus clarki virginalis) the official state fish. The Rio Grande cutthroat trout (Oncorhynchus clarki virginalis), a member of the family Salmonidae, is found in northern New Mexico and southern Colorado in tributaries of the Rio Grande. 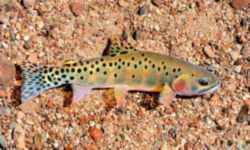 It is one of 14 subspecies of cutthroat trout native to the western United States, and is the state fish of New Mexico. It is dark olive color with sparsely scattered black spots. It derives its name from the bright red markings under its throat. 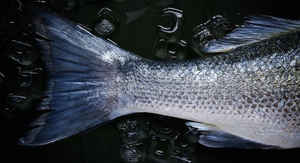 While it is normally grows to only 6 to 8 inches in length, anglers like the fish for its fighting spirit. 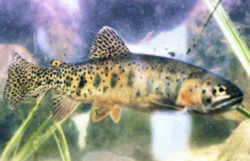 Rio Grande cutthroat trout have a yellowish-green to gray-brown body with scattered black spots. They have a densely spotted tail. The Rio Grande cutthroat trout is one of two native species of trout found in New Mexico (The other native New Mexico trout specie we have is the Gila Trout which is only found in southern part of the state). Genetically pure populations of this rare native trout still exist in several streams in northern New Mexico. Hybridization with introduced rainbow trout in the wild has created a new sub-species known as a cuttbow. This interbreeding has severely impacted most wild populations of the Rio Grande cutthroat. Presently, most populations of pure strains are restricted to small isolated headwater streams. Rio Grande cutthroats currently live on 150 miles of stream in the Santa Fe National Forest, which is only 15% of their historical range. According to U.S. Fish and Wildlife Service, 13 core populations remain in the wild. These are the key to the survival of the species. 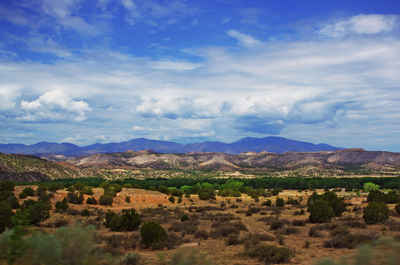 Four of the 13 core populations are located in the Santa Fe National Forest. The New Mexico Department of Game and Fish, with assistance from Trout Unlimited and New Mexico Trout, is actively reclaiming streams and restocking them with Rio Grande cutthroats. The Rio Grande cutthroat trout is a subspecies of the cutthroat trout and shares the characteristic red or orange slash mark under the lower jaw that has given the species its name. The fish can be identified by a unique pattern of black spots on its sides and tail, with concentrations of the spots toward the tail. Other cutthroat trout have black spots more evenly distributed on their bodies. Rio Grande cutthroat trout feed on insects, zooplankton, and crustaceans. How: The female lays between 200 to 4,500 eggs on a gravel nest in flowing water where high levels of dissolved oxygen exist. The Rio Grande cutthroat trout is the southernmost species of cutthroats. The introduction of the rainbow trout led a decline in the populations of Rio Grande cutthroat trout, combined with early logging, grazing, and hunting practices. While Montana, Idaho and Wyoming simply adopted the "cutthroat trout" as their state fish, Colorado, Utah, Nevada, and New Mexico adopted particular subspecies. The cutthroat trout, (Salmo clarki,) has 15 recognized subspecies. There are 5 subspecies of cutthroat trout in Idaho: westslope, Yellowstone, Bonneville, Bear Lake, Snake River finespotted. ARTICLE 3 - State Seal, Song and Symbols.